During the sixteenth and seventeenth centuries, British painting was dominated by foreign masters, particularly Dutch and Flemish. It was not until the eighteenth century that the English began to rival the work of their contemporaries from the Continent. One of the great masters of this period was William Hogarth, best known for biting satires of society that were popularized in now-famous engravings. 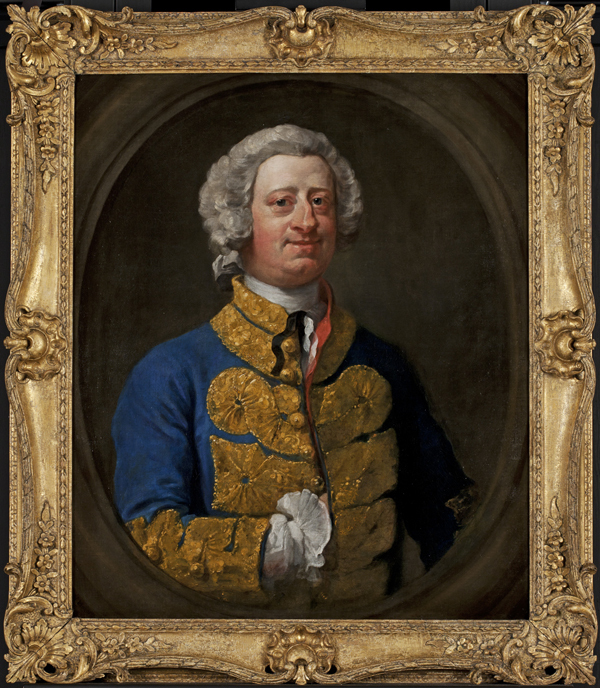 He was also skilled as a portraitist, capable of capturing the true character of his sitters. In this pair of portraits, he suggested the confidence of the country squire William James (1704-81), who had been High Sheriff of Kent in 1732 at the age of twenty-eight, and the somewhat naïve, but refreshing, demeanor of his young wife, Elizabeth (1723-98). Proud of their fine London fashions, the two are shown in an oval format, which could reflect the influence of Hogarth's visit to Paris the preceding year. See associated image, Mrs. William James.